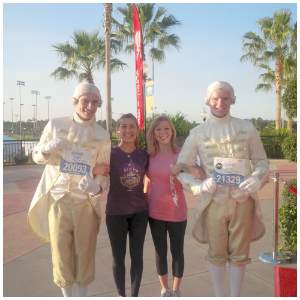 Fairytales and Fitness: Why this is a very special 5k. 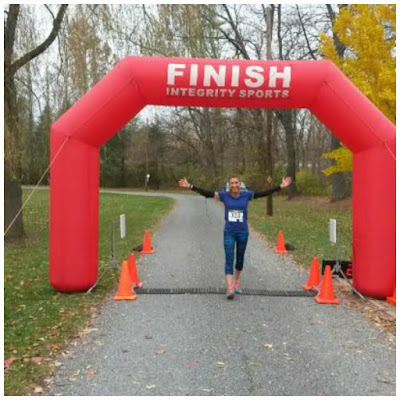 This weekend I participated in a 5k. Proceeds from most races usually benefit some type of cause/disease which is great. 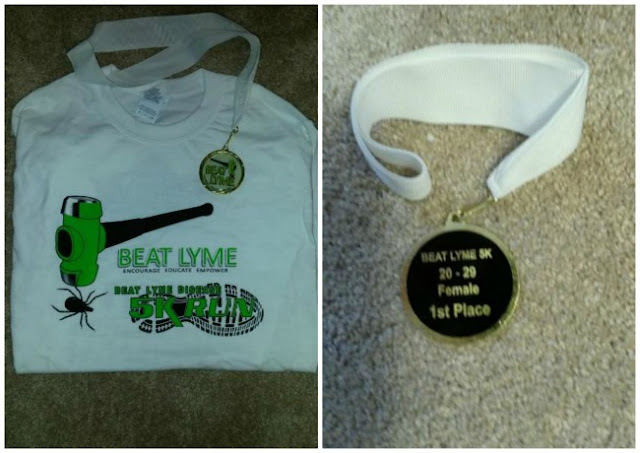 This race was special to me because it was a benefit for my cousin and others who are battling Lyme disease. Lyme disease is one that sometimes does not get diagnosed right away which can cause even more problems. Early detection is the key. My cousin was a very active athletic woman finishing up her Master’s Degree at the University of Tennessee when she began getting symptoms. Due to misdiagnosis (very common) she now has Chronic (late stage) Lyme disease and she is only in her mid 20s. She has 3 of the 5 co-infections that come along with chronic Lyme disease that causes fatigue, suppressed immune system, depression, GI problems, and neurological disorders are just a few that have been causing her health to deteriorate greatly. Me and my three cousins. For us runners that love being out in nature we have to be extra careful to take precautions. When out on a trail remain in the center in order to minimize your exposure to any wood piles or fallen logs where ticks live. Ticks cannot fly, they crawl, an interesting fact I was not aware of, so be sure to never sit on the ground. Make sure you always check yourself thoroughly after being outside in any wooded area. Wearing light colored clothing also helps. There is even tick repellent clothing you can wear. I didn’t have any goals in mind for this race other than just to run the race and support my cousin. My other two cousins were there (her brothers) to show their support as well. Before the race started I noticed that it was a fairly small race, so I may have a chance to place in my age group. Of course I started off way too fast like I always do, but especially in 5ks. I feel like you kind of have to because if you don’t, the race is over before you know it. I started off running with a few fast guys and one lady. I could see the leader way up there but there was no way of catching him. Soon enough he was out of site. So yes, a 6:55 is way too fast for my first mile! I eventually got in my groove and found a pace I was comfortable at. It was an out and back course through a park so you got to see the other runners. I saw my cousins who were cheering for me and high fiving while I passed them. It gave me the motivation to keep going at my current pace. I never look at the course map, because I always figure there is going to be someone in front of me and I will just follow them. And that was the case at this race as well. Just follow the crowd. Since it was a smaller race people were dispersed further apart but there were volunteers guiding you which way to go since there were several paths along the park. There was one lady that passed me, but I knew she was not in my age group, so I wasn’t worried about it. I followed her into the finish line and we both congratulated each other. While waiting for others to finish I was told that the leader of the pack, who would have probably won it (who also won the local half marathon the prior week), went off course and came in from another direction and got disqualified. He was not happy. Apparently he said there was no one there to tell him what direction to go at one of the turns. That is why it is so important to read the course map, at least for those that think they may be the leader of the pack and will not have anyone in front of them to follow. Guess us average runners never have to worry about that! After the race they had some door prizes to hand out then it was on to the awards. My name was called for first place in my age group. I was 6th place overall. Both my cousins placed in their age group as well. It was great to be able to take part of this event and share it with the family you love. Have you ever done a certain race to specifically support the cause? *We'll be linking this post up with the gals from Tuesday's on the Run. Great cause and congrats on placing 1st in your AG- exciting! It's no fun to get lost in a race so I'm glad it didn't happen to you. So far, twice for me! I hope you were able to get back on track. It happened to me at a local marathon where there wasn't anyone directly in front of me. Luckily I was able to figure it out quickly and turn around. Congrats on your AG award!! I have a lot of nightmares about having a great race and on pace to PR then getting lost! Luckily I'm also a middle of the pack runner so I don't think I have anything to worry about. Too bad about that guy, but like you said you have to be prepared! Congratulations on the win and love that this benefits lyme disease..I know a few people (and dogs) that have been affected so this is great! Yeah I'm surprised he didn't look at the course. Apparently they have other races at this same place that go in that direction he ended up going. Well different race, different course. Such a great cause and I was happy to be a part of it. 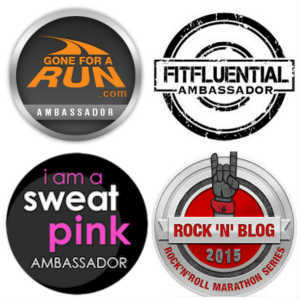 I love participating in races that help raise funds and awareness for causes, especially those that are important to me. Congrats on running a strong race, and your AG/overall awards! Thanks Kathryn. There are so many races out there that benefit great causes but since this one affected my family it was extra special. ahhh - love it was a family affair for a cause that means so much. Yeah me too. Ever since she has been dealing with this I have been extra cautious. I love that you and your family supported your cousin in this way. I know someone who is also experiencing the chronic effects of the disease. She is also young, which is so sad. I always check myself & my dog for ticks whenever we go on a walk. He's actually gotten ticks right near our house in the city! It's crazy how easy it is to get and not even know you have it until it's too late. It's nice to do a race that has a deeper meaning than just running, and how wonderful that you won your AG. Nice job - congratulations!!! Thanks Shelley. Yes, receiving an age group award was awesome but this race meant so much more to me than that. I love everything about this post. Congrats on your award, too!!!!!!!!!!!!!! One of my friends had Lyne a few years back and it really derailed her for quite some time. She still has lasting side effects. I am all for raising awareness! It's awful the side affects that come with it, especially when it is not diagnosed right away. What a great cause! I knew a young gal once who was misdiagnosed and by the time they caught it, it was too late and she has since passed. Its definitely a cause that needs more awareness! Even better you did it for a relative. I did the Disney World Matathon once and raised funds for cancer research I enjoyed it but am not sure I would ever so a large scale fundraiser again. I do think these smaller ones like what you did are far more beneficial. I bet fundraising for a large event (especially a Disney Race) would be so hard. Like you said, I think smaller races are good for this cause. Especially if it's going directly to the people affected with it that you know. That is a great cause to race for. That is sad your cousin has late stage and is so young. Thanks Karen! She is getting the best treatment out there. And she is a fighter and I know she will beat this! what a great 5k, supporting family! going of course is one of my race worst nightmares! Im never the fastest person though so I guess I dont have much to worry about...unless everyone does follow the leader and we all get off course lol. Haha yeah that is True. Luckily we didn't follow him so we were all good. Congrats on your first place AG! And what an awesome cause!! Thanks Courtney! Making awareness is so important. Congratulations, and going off course can occur during a race or just in life in general. God speed. since he would have won. Wow! Raising $600 for a charity is awesome! I didn't think twice about running this since it was for my cousin and to help support the cause. What a awesome cause to run for! Congrats on the AG award!!! Thanks. It was a great race and even better cause. 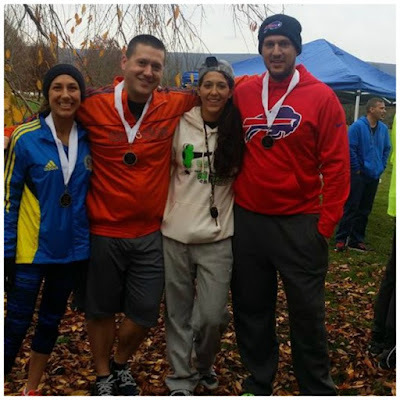 What a great run for your family to participate in! I am married to an avid hunter and I have found 2 ticks in 12 years buried in his skin when he has come home- serious business! Oh my! Everyone should be doing thorough checks on themselves after being out in the woods. Good thing you caught it. This is such a timely post for me! Yesterday I saw a little girl in clinic who came in after being bitten by a tick. The mom was freaking out, but the tick she brought in for me to examine was a dog tick, not a deer tick. I had Lyme disease a few years ago--luckily I caught it when I had the bullseye rash--and so I was really knowledgeable about all things Lyme. If I have a kid come in with joint swelling/pain, in addition to the arthritis workup I do, I add Lyme titers as well. I've had 2 patients come back positive for Lyme who denied ever being bit by a tick. Pretty scary. And on my blog Friday, I have my interview with Bart Yasso. Did you know that he has chronic Lyme? He can't run long distances anymore due to the pain. Really interesting post! And great run, BTW! Thanks. I'll be sure to read that. I have read his book awhile ago so I'm sure I've heard that but when I read it my cousin was not diagnosed then so I don't think I really knew much about what it was. What a great cause! I'm hearing more and more cases of Lyme disease. Very sad it gets misdiagnosed so often. Knock wood, I haven't run off course yet, but know many runners who have. Yeah that's one good thing about the middle of the pack runners. We just follow the crowd. Congrats on the AG award! Lyme is a tough DX. What a great cause to get out there and support your family over. Thanks Patty. I was happy to be able to do this and support my family. That's great that you could participate in a race to support your cousin. Lyme disease is serious and more people need to know about it. You did awesome in this race, congrats on winning your age group! Thanks. Yes I think there definitely has to be more awareness of this disease. Congrats on your finish!!! That's awesome! Thanks Julie. Oh no. Hope you were able to find your way back before it was too late. Congratulations on your award! Lyme disease is so scary, so I'm glad you were able to support the cause. I've never gone off course, but I ran a trail 10k where a girl came out of no where after a water stop... it was like she did the looped part of the course backwards. I don't think she was disqualified because only a few runners and volunteers saw her and we were all confused. She was, of course, in my age group and finished before me. ;) Oh well. Maybe that water was just what she needed to keep her going. Congrats! What a great run. My cousin had Lyme disease. Ack! Luckily it was treatable. Great job! Thanks Rachel. She is getting the best treatment. I've had races before where it was small and I wasn't sure of the direction - frustrating! Congrats on your finish! Congrats on the age group win. Bummer for the winner - I've never gone off course but I'm also never anywhere near the front LOL. Awesome!! congrats on the win!! Lyme disease is so terrible, I have several friends that have been suffering from it. Thanks for running for a great cause! Lacey, congrats on winning your age group!! That's so awesome! I'm so sorry your cousin is going through all those health issues due to Lyme disease. I've heard misdiagnosis is common. And thanks for the tops on avoiding the ticks - I was out hiking recently and it occurred to me I have no idea of what to do to avoid ticks.